Ask fellow campers about "Hinton / Jasper KOA" and nearby attractions. Really enjoyed our stay. Clean and friendly! Laundry worked great! Best bathroom facilities I've seen. WiFi adequate! Cell service works. We camped at Hinton / Jasper KOA in a Motorhome. Good for a short stay.Campsite is flat and wide open. We camped at Hinton / Jasper KOA in a Fifth Wheel. We stay there so we can get food from Gus' Pizza. Rate is expressed in USD or about $53Canadian. We spent a week here outside of Jasper NP. Close to town of Hinton for necessities. The park is very Big Rig friendly as it's easy in and out of pull thru sites. Not a very pretty park as there are no trees but in between each site is a grassy spot with a picnic table or, in the pricier sites, a patio with nice chairs and a table. For a US vehicle, a satellite TV signal is extremely difficult to attain but the KOA provides a cable hookup with quite a few TV stations, including US networks. WiFi during the day works pretty well but slows noticeably in the evening when the campground is fully occupied. We don't use the showers or restrooms of most campgrounds since we have our own but based on how everything else seems well maintained I suspect these facilities are too. Helpful staff upon check in but did not require any further assistance during our stay. 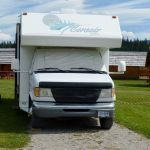 This is a comfortable park that can be used as a base to explore Jasper NP even though it is a bit of a long drive to get to most park features. We camped at Hinton / Jasper KOA in a Motorhome. Due to the 40 mile ride just to the town of Jasper inside the park, we opted to rent a Parks Canada cabin for a couple of nights to be closer to the action. Left our rig in the KOA. I would also recommend the lodges and hotels in downtown Jasper as a possible alternative as well. Since we are full-timers, we sometimes stay in a hotel as a part of our vacation experience and, in this case, for greater accessibility and convenience. The drive in is on good asphalt to get to the park located behind ranch houses and barns and is several hundred yards off the main highway. No road noise to speak of. The staff was friendly and the office/store well equipped. The roads and pads are gravel and the sites are level. There is nice space between sites separated with lawn grass. Nice dog park and plenty of grassy areas to walk the dogs. The showers were clean and well maintained. WIFI was limited but gets better when people leave. We camped at Hinton / Jasper KOA in a Travel Trailer. Big wide open park with space between spots. We had a long pull thru with easy in and out without disconnecting. Decent amenities although bad weather limited use. Utilities (50 amp!) worked great. Logical placement. The entrance has the worst looking wooded single lane bridge I ever saw. We are 26 tons and I genuinely worried until we made it. Wooden planks BADLY need to be replaced. Other bit- we had a very young/inexperienced check in person who badly needs training in hospitality. We had driven 500 miles thru snow and the last thing I needed was an attitude/the greeting I received. On the other hand the guys that show you to your space were also inside and hooked me up with maps and restaurant suggestions before we left for our space. This is a high volume in and out park and the office could be a little more personable. We opted for a more expensive patio space. Probably not worth the cost but it seems those spaces are wider. I would do it again. We camped at Hinton / Jasper KOA in a Motorhome. If you need dog daycare/boarding call Anderson's. It is about 30 minutes away from the park but the owner is the most loving animal person I ever met. I called the mobile RV repair guy listed on the park brochure. Left message and never returned my call. I wound up doing the work myself. Nice park with nice owners. No trees and afternoon sun is killer unless there is a camper next to you, you can get in it's shadow. About 45 min. to Jasper. We camped at Hinton / Jasper KOA in a Fifth Wheel. When I made the reservation we could onlt get 2 nights, but the employee I talked to managed to find us 2 more nights. The park is very clean and nice, friendly employees. Yes the price is high, but I have see higher KOA's. With the exchange rate it is comparable to prices we paid in Alaska, and they were nowhere as nice and only 30 amp. Don't use GPS. It tried to take us somewhere else. Watch for their signs. A nice big one on a semi that you can't miss. We camped at Hinton / Jasper KOA in a Fifth Wheel. This is a typical KOA, with lots of stuff for kids (but no pool or stocked fishing pond), excellent maintenance, and accommodative staff. A few quibbles can be made. The daily fee of $C75.95 was for a "deluxe site," said to be "the last spot available" when we called a couple days ahead in mid-season. "Deluxe" gets you a patio with table and four plastic imitation wicker chairs - one with bird droppings - plus a gas grill with rusted-out burners. Site driveways were narrower than usual. 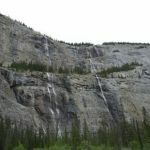 The Hinton/Jasper location is a misnomer because the camp is 2 miles from the small town of Hinton and 38 miles from the National Park headquarters town of Jasper. We camped at Hinton / Jasper KOA in a Motorhome. 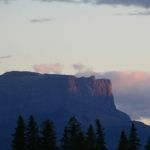 Jasper National Park is worth several days of expeditions. The boat trip was a bit of a disappointment: great scenery but no chance of seeing wildlife. Very nice park with a cool little fenced dog area. Wide open, so we got satellite TV with our DISH tailgater. This was the last place we were able to get satellite reception as we headed north. Plenty of grass to walk the pups. Staff was very friendly and helpful. We camped at Hinton / Jasper KOA in a Motorhome. "Wide Open Well Kept Park" Park is located in a quiet open area away from any highway noise. I was given a gravel pull-thru site (52) for my 42' 5th wheel. Site was a 50 Amp FHU with cable and wifi. The park is in the open, so a dish will also work here. Had plenty of room to un-hook and park my truck. I had a nice grassy area with a picnic table and room for some lawn chairs on my site. The sites are a little close together, but easy to get around in. Laundry & Bathrooms are clean and up to date. The park is decorated with many flowers and is well kept up. The park is close to Jasper Park and just outside of the town of Hinton if you need supplies. Would definitely stay here again. We camped at Hinton / Jasper KOA in a Fifth Wheel. Park is just outside of Hinton and close to Jasper Park. Loved the park. It was very clean. Twice a day had free BBQ hamburgers and ice cream. Very helpful staff. Would love to stay again. We camped at Hinton / Jasper KOA in a Motorhome. Dozens of lakes nearby. Shopping close by in Hinton. Very accommodating when we asked for an extended stay. Beautiful first view of the mountains in Jasper. We camped at Hinton / Jasper KOA in a Fifth Wheel. Have great wash-rooms and showers, small store that just about provides everything you might need, if not avail Hinton is a 15 minutes drive away and the town has everything. The staff are very friendly and easy to talk to. For people with dogs there is a dog run and a games room and outdoor swings etc for kids. They also offer rental of small cottages and log cabins. Signs displaying quiet hours were posted in several places, but the quiet hour time was definitely not enforced. Wide sites, did not feel on top of our neighbors. Laundry was small (4 washers, 4 dryers) but very clean. We camped at Hinton / Jasper KOA in a Fifth Wheel. To be fair we arrived in pouring rain which left the roads with numerous puddles. Our site was well drained and level. Cable is limited. Wi-Fi was slow. It was a good overnight stop on our way to Banff. The grass was in desparate need of mowing but this was probably the result of constant rain. We camped at Hinton / Jasper KOA in a Motorhome. 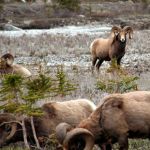 Do not miss traveling the Icefields Parkway! This is the cleanest park in which we have stayed. The washrooms are spotless. Close to town and easy access to the highway. We have stayed here several times and will continue while passing through the area. We camped at Hinton / Jasper KOA in a Travel Trailer. The small town of Hinton is 5 miles away & it's big enough to have anything you need. Park is close to Jasper National Park, about 45 minutes away from Jasper itself, and close to Hinton which has all conveniences (although they close fairly early). Note that the park closes its gate at 11:30pm. Keep it in mind when visiting Jasper Natl Park. There is an old coal mine town down 4o South (believe it is Cardin) it is about 25 miles and worth the trip. The food was just ok. The town originally had 2,500 down to 31! Also the Beaver Pond in Hinton is a great morning walk, we saw a beaver and 4 wolves. It is very well done!!! Hike the Beaver trail in town. We saw a couple of beavers and also picked up a few geocaches. 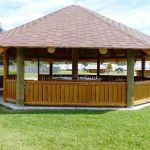 Hinton has tons of parks and playgrounds for the kids, good services (Safeway, Canadian Tire, Walmart, etc), and Switzer Provincial Park is close and gorgeous. Our favorite drive was to Cadomin, a very small town about 30-40 miles away. On the way there, we saw a grizzly, several elk, and a bunch of bighorn sheep. Plus, there's a general store in Cadomin that makes world-class burgers. In fact, we were doing a lot of trip planning/research online, so we ended up spending a good deal of time at the Hinton Municipal Library (which is a great spot, too). 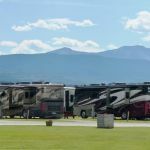 Are you affiliated with Hinton / Jasper KOA ?